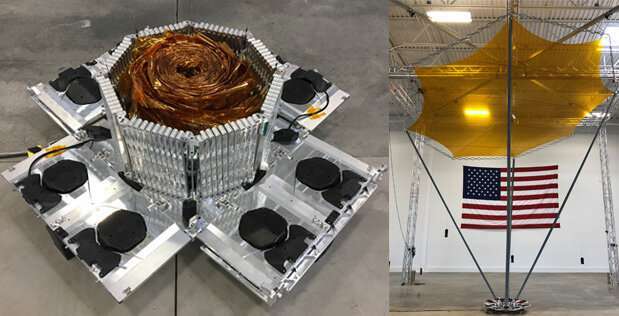 DARPA's Radio Frequency Risk Reduction Deployment Demonstration (R3D2) is set for launch in late February to space-qualify a new type of membrane reflectarray antenna. The antenna, made of a tissue-thin Kapton membrane, packs tightly for stowage during launch and then will deploy to its full size of 2.25 meters in diameter once it reaches low Earth orbit. "The Department of Defense has prioritized rapid acquisition of small satellite and launch capabilities. By relying on commercial acquisition practices, DARPA streamlined the R3D2 mission from conception through launch services acquisition," said Fred Kennedy, director of DARPA's Tactical Technology Office. "This mission could help validate emerging concepts for a resilient sensor and data transport layer in low Earth orbit – a capability that does not exist today, but one which could revolutionize global communications by laying the groundwork for a space-based internet." The launch will take place on a Rocket Lab USA Electron rocket from the company's launch complex on the Mahia Peninsula of New Zealand. Northrop Grumman is the prime contractor and integrated the 150 kg satellite; MMA Design designed and built the antenna. Trident Systems designed and built R3D2's software-defined radio, while Blue Canyon Technologies provided the spacecraft bus.